The sun was shining through thin cloud, and so the sunlight hitting the landscape wasn't quite as strong as I had been hoping. 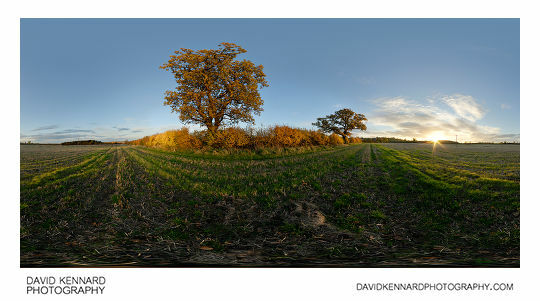 I actually took this panorama twice - the first time the sunlight was even weaker. Then, just as the sun was going behind the hill, the cloud in front of the sun thinned more, so I quickly took the panorama you see above. 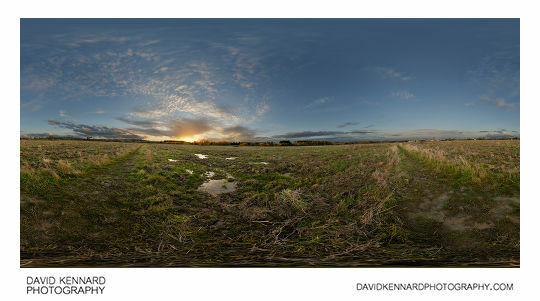 I also took another panorama in Farndon Fields, in a similar position to where I took the panorama in the morning. I used the tripod at its smallest height to try and get an angle where some of the clouds would be reflected in the puddles. Possibly I should have moved the tripod nearer to the puddles, but then I would have lost the path from the photo. If you compare the above to a pano I took in Farndon fields back in August, you can see that the field has been now cleared for the building work. Hopefully as time goes on I can carry on taking photos around Farndon Fields and document the progress from countryside to housing estate.